Drafting & Art Furniture: Shop From Our Great Selection! Let imagination and creativity soar in a well-organized art room. What makes a great art room layout? Start off with some comfy seating and generous work surfaces. 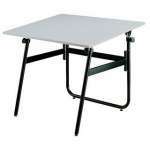 With our extensive collection of art stools and activity tables you will quickly find the perfect combination. 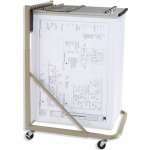 Next, choose the necessities: easels, whiteboards and a storage cabinet to keep all your supplies handy. At Hertz Furniture, we have the school furniture you need to equip a full art studio for your students, whether you are furnishing a preschool or high school. Our top-quality art room furniture features student-friendly designs that will help young artists find their muse and develop their creative talents. 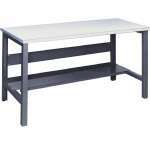 What kind of art tables should I get for my school? In the production stages of any project, it is important to have an appropriate workspace. The right kind of art table or drafting table will depend on what mediums your students are working with and what level they are on. Advanced design students need drafting tables because they provide the ideal arrangement for accurate and steady sketches. If your students are working with heavy-duty materials, it is important to make sure that art tables are strong enough to support whatever they are using and constructing. Younger students also need a great place to produce projects and a level surface is great for students who are still developing their basic coordination and perspective skills. When a preschool or elementary school art room is furnished with great activity tables, students can focus on doing their best and experimenting with different styles and materials. Preschool tables encourage your youngest learners to enjoy art and explore the properties of different materials. You can demonstrate the importance of art in education by giving students the right art room furniture from a young age. 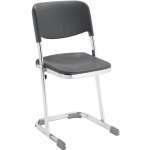 What kind of easels should I get for my school art room? When you are designing a room that will be used for many different kinds of projects, you should keep in mind that a variety of work spaces is desirable. While tables might be great for clay and pompoms, it might be harder to reach all of the corners of a paper when painting on a table. 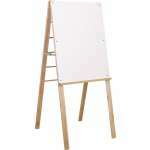 We have easels for kids made with a number of different surface materials which are great when teachers are giving demonstrations or students are working on paintings. What kind of seating is good for an art room? Whether your students are working at art tables, drafting tables or easels, they will want to have an appropriate place to sit. Because work surfaces in an art room are often higher than regular tables, art stools can provide great seating for this venue. 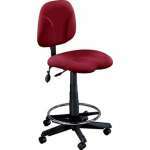 We have a great selection of art stools in a variety of styles including swivel, non-swivel and adjustable-height. 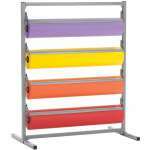 Do I need an art drying rack? Students work hard to produce original projects in art class, so it is important to make sure that their masterpieces do not get damaged. 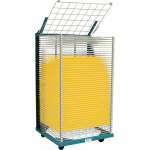 In order to ensure that projects remain organized and protected, it is a good idea to purchase art drying racks. Rather than searching for places to put everything and taking up precious table and counter space, you can keep everything organized and protected on individual shelves. A design studio also requires a space for completed drafts and works in progress. 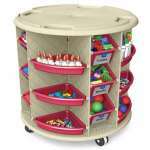 Whether you work for an architecture firm or are teaching students about the elements of design, blueprint storage can be quite helpful. With many similar projects or drafts of the same project, it is easy to get confused. Having a clear space for everything ensures that projects stay organized. Most project spaces are used by a number of classes during the same time period. 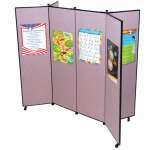 With different groups coming in every few minutes, it is quite possible that many types of materials will be needed in the room over the course of the day. To save the time and effort of going back and forth to a separate storage closet, you can keep great storage cabinets right in the art room. Where is a good place to display student projects? Teachers and students put a lot of effort into designing and executing projects. When people come into your school, whether they are parents, visitors or prospective students, you want to showcase your support of the arts. By putting up bulletin boards around your art room, you can display work in a prominent place to show students and visitors how proud you are. All students, whether they are in public, private or charter schools, need opportunities for creative expression. Help students and teachers maximize their creative potential by furnishing your art room with functional and attractive school furniture from Hertz Furniture. Whether you need easels, art tables, stools or a little bit of everything, we can help you find some great choices to fill your space. If you want help determining the ideal layout or finding the correct model, contact the Hertz Project Solutions team.